References: 14 CFR parts 71, 91, 93; Navigation Charts; AIM..
Use the recommendation in Task D, #3, to practice recalling VFR weather minimums for all classes of airspace. If an airport is below VFR minimums, for example the ceiling is reported as 900 BKN or the visbility is reported as 2.5 SM, how can you arrive or depart this airport? From who would you request Special VFR at a controlled airport? For an uncontrolled airport? Study 14 CFR 91.157 for Special VFR requirements. Use the recommendation in Task D, #3, to practice recalling rules and equipment requirements for all classes of airspace. 3. 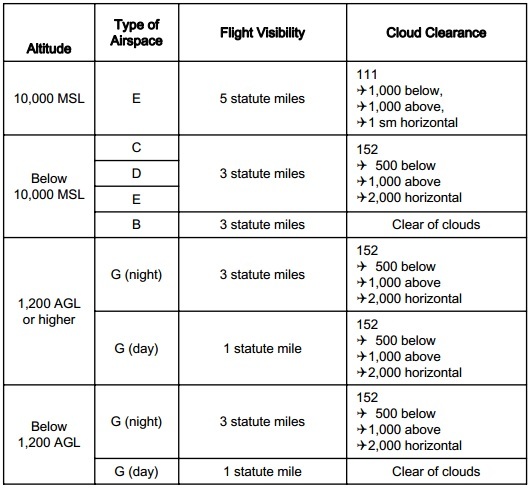 Special use, special flight rules areas, and other airspace areas. You need to be intimately familiar with MOAs, MTRs, Alert areas, Warning areas, Restricted areas, Prohibited areas, ADIZ, TFRs, TRSAs, SFRAs, and wildlife refuges. You need to be able to recognize their depiction on charts, and understand the risks and any associated rules and operating procedures. While planning cross country flights, research all SUA along and within 50 NM of your planned course. Recall that most SUA on a chart is also described in tables on the back of the chart. Check http://tfr.faa.gov for each cross-country you plan to determine if a TFR is along your route of flight.